Quality of life (QoL) is a multidimensional, holistic construct assessed from many different perspectives and by many disciplines. Moreover, the concept of QoL can be applied to practically all important domains of life. Thus, QoL research has to include social, environmental, structural, and health-related aspects, and be approached from an interdisciplinary perspective. This holds even more when QoL in old age is the focus because ageing itself is a multidimensional process. General QoL studies have used age for many years as a social category like gender or social class, but apart from a few exceptions (e.g. Diener and Suh, 1997; Michalos, 1986; Michalos et al., 2001) they have largely neglected older people. 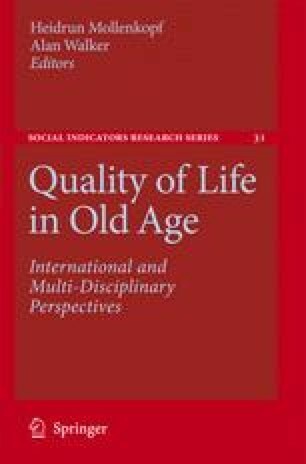 Brown, J., Bowling, A., and Flynn, T. (2004) Models of Quality of Life: A Taxonomy and Systematic Review of the Literature, Sheffield, University of Sheffield, FORUM Project (http://www.shef.ac.uk/ageingresearch).